These are views of the outside and inside prior to dismantling and repair. Reaction provided by rotating tickler coil inside main tuning coil. The tuning condenser (together with knob) is made by "Ormond" and has aluminium plates. 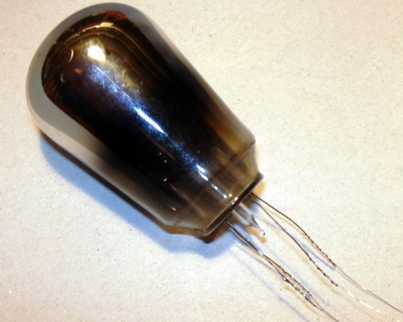 The inter valve transformers are "Sutra" made in France (ratios 3:1 and 5:1) the anti microphonic valve holders manufactured by Aermonic (model H). Wiring as can be seen is bare tinned copper. Almost hidden by the coil is the combined grid leak resistor and capacitor made by "Lissen"
the stop on the tickler knob was broken. perished wires to tickler coil. 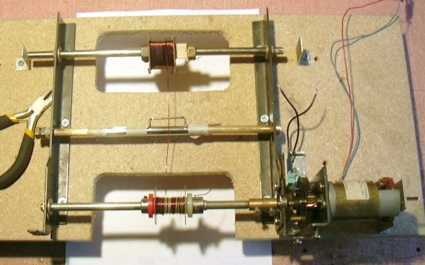 open circuits on tuning coil at eyelets around the top. one turn on the coil had been damaged and some turns were loose. loose base on detector valve and open circuit on connections to base. 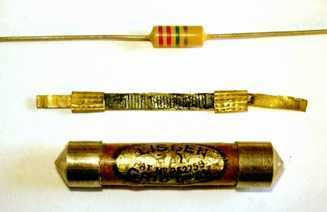 the grid leak resistor when measured gave a resistance of 6M ohm. open circuit on second inter valve transformer. there were no connections for the speaker, battery connections etc. The front panel was polished with very fine wet and dry paper using white spirit as a lubricant to remove the deeper scratches and then polished with T-Cut automobile polishing compound. This was a lot of hard work! The base board was lightly rubbed down with glass paper and painted over with black drawing ink. All the screws, nuts, bolts and small metal parts were dipped for about 30 seconds in lavatory cleaner (which contains hydrochloric acid) and then attacked with a tooth brush and finally rinsed in boiling water. The knobs, variable condenser and valve holders were washed in warm water and detergent using a toothbrush to remove years of dirt from the nooks and crannies. T-Cut was used to polish the front faces of the knobs. The dial graduations were filled using a white "Snopake" correction pen and polishing off. The on/off switch was repaired using parts from a 1/4" jack plug and a small Bulgin knob which I happened to have and a a small piece of stainless steel was used to make a stop for the tickler knob. The wires on the tickler coil were replaced with non-authentic plastic insulated flexible wires and the open circuits were rectified by soldering the wires to the eyelets. The coils were then carefully cleaned and dusted and coated inside and out with one coat of shellac varnish. The base of the detector valve was removed (only two pins required the heat of a soldering iron for it to be freed) the leads to the envelope were tinned and thin wires attached to aid re-assembly and make a better connection to the pins when the base was put back on. I used "araldite" 2 part epoxy for gluing the base back on. Although some people use super glue, epoxy takes longer to set and there is a chance to take it apart if you make a mistake. The valve pins were cleaned using 000 grade wire wool and their diameter slightly expanded by inserting a blade into the slots. The next problem was the most troublesome, the primary winding (the one nearest the core) was open circuit. I decided to take it apart and rewind it, but when I saw how fine the wire was I realised that I would need to make a coil winder! In amongst my junk I had some salvaged parts from an IBM Quietwriter printer and sundry rods and brass bushes, The motor and one stage of reduction originally moved the carriage via a toothed belt. It worked and by applying a variable voltage between 5 and 12 volts it has more than sufficient torque for the job in hand. Unfortunately I was not careful enough when unwinding to ensure that the wire was wound evenly on the take up bobbin. This meant that on rewinding I had several breakages and a tedious job joining and insulating the breaks. Finally it worked, the transformer was re-assembled and I had a potentially working wireless. Now the set was ready to be tested, temporary connections to bench power supplies with the valves connected in series ( I did not have a suitable supply for 2 Volts at 600 mA) a good aerial and a small moving coil loudspeaker connected via a step down transformer produced vicious squealing which was reduced by adjusting the relative position of the rotating coil on its shaft. 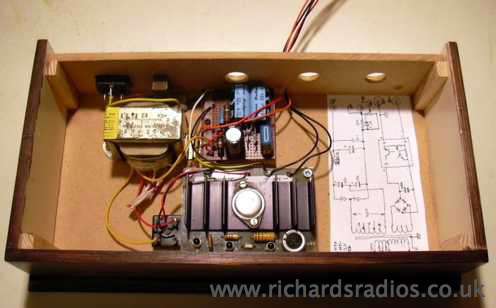 With a bit of playing about with various HT voltages from 60 to 100 volts and experimenting with the grid bias voltage the set was able to pick up quite a number of stations. Finally I made the power supply shown below, The most suitable transformer to hand had a 32V centre tapped winding and a 16V centre tapped winding. By removing the outer insulation and separating the tapping on the 16V winding I ended up with a transformer with one 8V and one 40V winding. 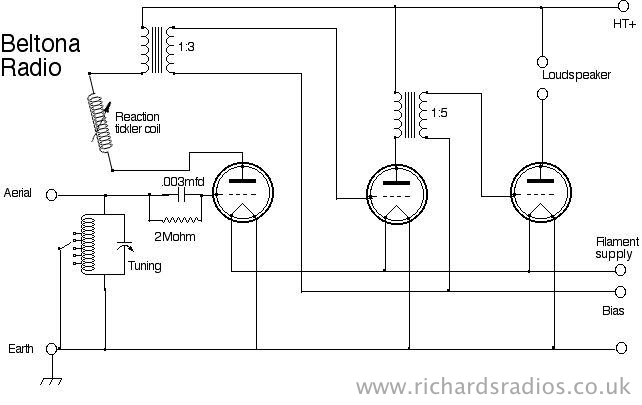 The HT supply was provided by making up a voltage doubler circuit and the GB supply was provided by inserting a resistor shunted by an electrolytic capacitor in the negative lead. The 2Volt supply is provided by the full wave rectifier and one of several 2N3055 regulated supplies that I have had lying about for many years. 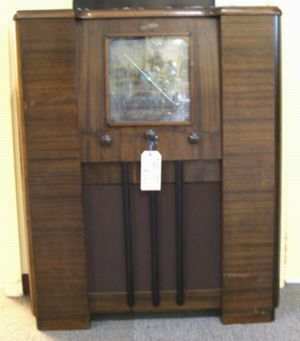 The box was designed to act as a plinth for the radio and was stained and given a coat of "Briwax" so that it more or less matched the colouring of the cabinet. If you know anything of this set or have any suggestions please let me know. 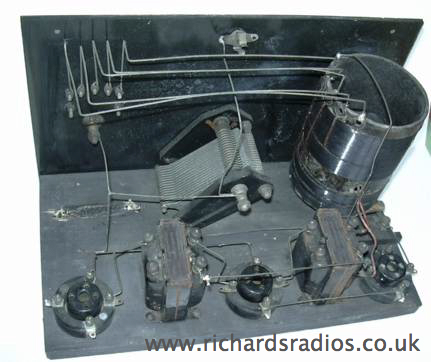 I have now brought the set in from the workshop and set it up with my Ormond moving iron speaker(see this page) and an indoor aerial strung along the picture rail and received several European stations. Of course it worked much better with the external aerial strung from my workshop to the roof of the house. There was a terrible hum when I placed set on my power supply plinth, I have now relocated the transformer and incoming power connector and switch at the right hand side of the box (not now as shown in the picture above), this has reduced though not eliminated the annoying 50 Hz hum listen The other thing I have realised is that the valve being used as a detector (Mullard PM2A) is really an amplifier triode (too high inter electrode capacity? ), this will explain the difficulty in setting the reaction. I have a feeling that the detector valve should have been a PM1HF or something similar. Do you know? 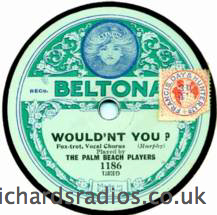 From 1922 receivers manufactured in the UK were required to carry a distinctive label indicating that royalties had been paid and listeners had to buy an annual licence costing 10s (50p) which only permitted the use of receivers made by members of the BBC. Initially half the licence-fee went to the BBC and the rest to the other six members. Receivers would carry two tariffs: one based on the receiver's components, would go to the BBC and the other amounting to 12s 6d (62.5p) on each valve-holder, would go to the Marconi Company as a royalty in return for allowing their patents to be used. 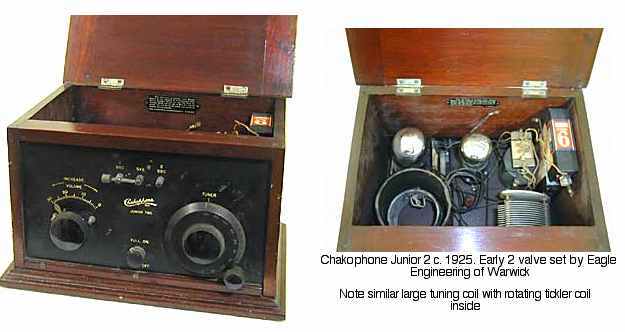 A simple crystal Set of 1923 vintage housed in a polished mahogany case with lift up lid and ebonite control panel would have cost �5 10s (�5.50) of which 7s 6d (37.5p) was a royalty paid to the BBC. With no valves the crystal set had a considerable price advantage. 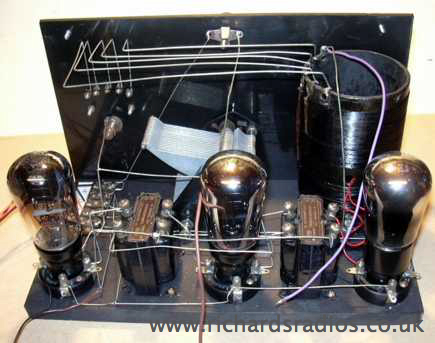 For example a two valve set of this period might have cost �24, including �1 15s (�1.75) royalty paid to the BBC and �1 5s (�1.25) royalty paid to the Marconi company. From the information on the history of Beltona Records below I imagine that it was probably made before 1927. These pictures (of a similar but only a 2 valve set) indicate that it may have been made even earlier. 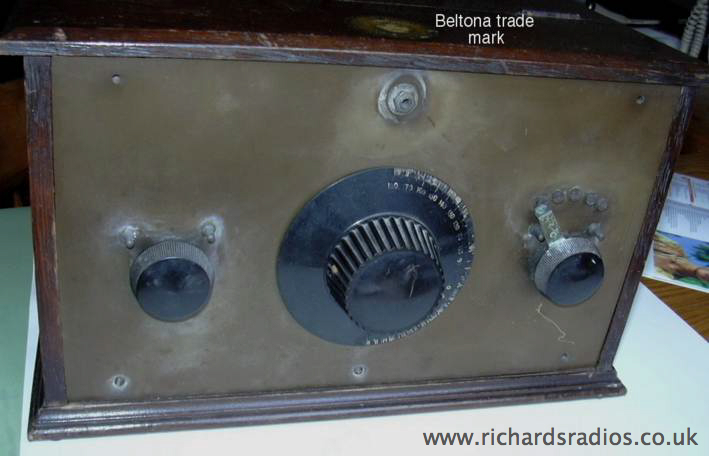 "Very many thanks for your message about having found a Beltona radio. I had no idea that they had their own brand of radio for sale, however, they certainly had their own brand of gramophones, gramophone needles and various other products. It doesn't really surprise me to learn your news as Murdoch Trading Company/John G. Murdoch & Co. Ltd owned very many retail shops, some selling records, pianos and allied goods, whilst others were specialist furniture dealers." The Murdochs came from Tibbermore, Perthshire but later some family members [possibly only John G, and his family] moved to Glasgow to work for Collins and later to London. The firm of Murdoch Trading Company was formed (about 1871), and based, in London but John G. Murdoch & Co. Ltd. (the owners of the Beltona trade mark) was registered as a private limited company in 1886 and as a public limited company in 1927. Apart from selling records and gramophones they had always dealt in the sale of pianos and other musical instruments through mail order and various retails outlets. Thanks to Colin Smythe (23/04/05) for the following biographical details and for his corrections to the previous paragraph. Early in life he was apprenticed to block cutting for printing on cotton, but block printing having been supplanted by machine printing immediately after the end of his apprenticeship, he preferred not to be tied to a decaying trade and signed articles for a second apprenticeship to the new process. As an apprenticeship in those days was invariably for seven years, he was about 27 years old [in 1857] before his apprenticeship days were over, although he had begun at the age of 13. After being engaged for several years as a machine printer he began to long for a wider field for his energies, and although his employers were reluctant to part with him, and promised him rapid promotion if he would remain, he relinquished the cotton printing and connected himself with the firm of Messrs. Collins & Co. , of Glasgow, who were developing business rapidly as publishers of Family Bibles and similar works. He established successful agencies for their publications in Glasgow, Liverpool, Manchester, and other towns in the North of England. In 1871 he came to London and began publishing on his own account, his principal business continuing to be in Family Bibles, of which he issued editions in Welsh and Dutch, as well as English. At that time the Family Bible was more popular than it is today, and Mr Murdoch's annual output for a number of years was more than 30,000, which were supplied to all parts of the Empire. 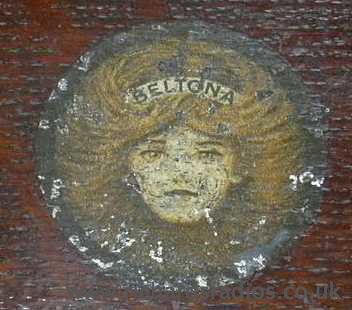 The first Beltona records appeared just after the first world war and were made by Crystalate. It was 1922 before the label was revived with the familiar design (see picture) though initially the colours were red and buff rather than turquoise and light turquoise. In 1927, the label design changed to a black and white design and soon after this, Edison Bell started providing the masters. In 1937 thereabouts the label was bought by Decca Records. The label concentrated on Scottish and Irish music for the rest of its life and ceased to exist in the late 1950s. Case: Blackwood veneer, original bakelite knobs. 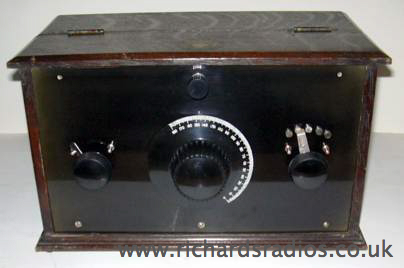 Movement: Valve radio, fully restored & guaranteed.